Rihma was purchased by us specifically as a linebred outcross mare, to breed to the intensely linebred Crabbet stallions, Phara Farm’s The Sun Prince and Burgundy Sun. This will continue the golden cross of Mesaoud with Skowronek, so successful for Ben Hur and Lewisfield with their Aarah-Raffles champions like Aaraf, Aarafa and Lewisfield Sun God. With this cross, we hope to keep the fabled teacup muzzle, chiseled face and large eyes of that most famous Egyptian mare and add the extreme jibbah of the Phara horses. 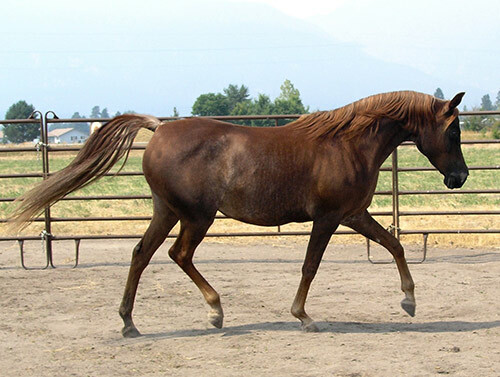 Rihma is an exceptionally tall, leggy mare at 15.1 hands with the added bonus of the rare liver chestnut color. Blending two of the most classic chestnut lines in the breed, Lewisfield Sun God and Moniet El Nefous, Rihma produced three offspring so far: the burnished chestnuts, The Moniet Sun and his full sister, The Sun Orchid and the exotic black liver chestnut, The Ebony Sun. Straight Egyptian KYOBI RIHMA combines the best of Babson, Pritzlaff and Gleannloch breeding-all lines noted for their beautiful athletes. 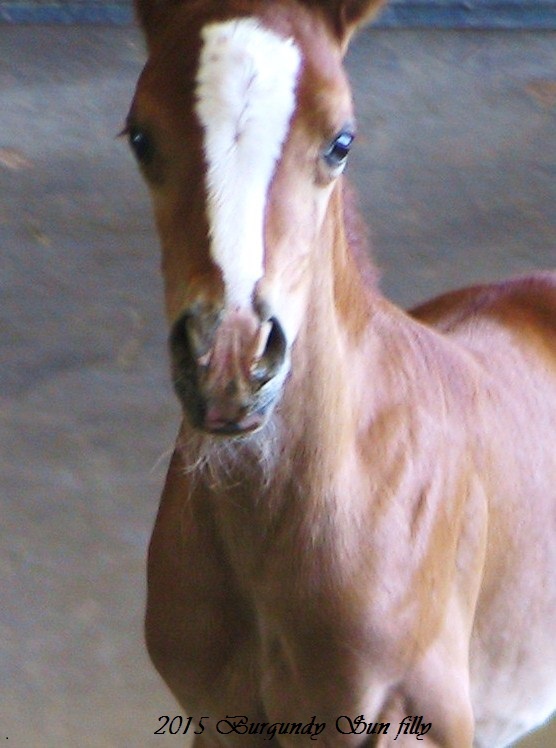 She is a paternal sister to RAVENWOOD KALILA, a ribbon winner in hunt pleasure at the Egyptian Event, and to RAVENWOOD KHATANA, whose daughter MISTY NADIRAH was the 2007 Egyptian Event Reserve Champion Egyptian Bred Yearling Futurity Filly. KYOBI RIHMA is by RAVENWOOD MONEE, the sire of 2010 Egyptian Event Leading Dam RAVENWOOD FINALE. RAVENWOOD MONEE Is a paternal brother to twice Canadian Reserve National Champion Half-Arabian Trail AOTR and U.S. Top Ten Trail AOTR MT UNIQUE, to U.S. National Champion Competitive Trail and halter champion RAVENWOOD DÉJÀ VU, and to regional winners in country pleasure driving, English pleasure, hunt pleasure and halter including Region 6 Champion Stallion AOTH and Region 8 Top Five Stallion RAVENWOOD JALEEL, sire of 2006 Arabica Show (Germany) Reserve Senior Champion Mare FOCUS JALEESA and of 2009 Canadian Reserve National Champion Stallion AOTH and U.S. Top Ten Stallion AOTH ER INVICTUS. RAVENWOOD MONEE is also a paternal brother to TSEA TRAVELER, sire of 2010 U.S. Top Ten Training Level Dressage, RASHAD ALCIBIADES+. RAVENWOOD MONEE’s sire RG AL MONE is of all Pritzlaff breeding. 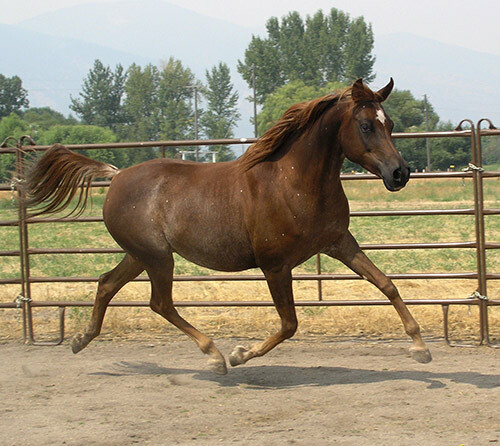 Horses with Pritzlaff are noted for their success in the show ring in performance in disciplines from working cow to park and also on the endurance trail, with numerous successful endurance horses of straight Pritzlaff heritage. RG AL MONE has sired National and regional winners in performance and 7 of his get have produced winners in halter or performance at the Egyptian Event. Their winning offspring include Egyptian Event Reserve Champion Mare ATH BBT QUINTESSA (who is a double granddaughter of RG AL MONE) and Egyptian Event Champion Western Pleasure and Reserve Champion Western Pleasure ATR/JTR BBT MAJESTIC. RG AL MONE is by ALCIBIADES, a full brother to 4 champions: halter reserve champion BIMONIET RSI, 1972 Region 5 Champion Mare MONISA RSI, 1977 Region 2 Top Five Stallion RASMONIET RSI (maternal grandsire of KYOBI RIHMA), and U.S. Top Ten Mare BINT BINT MONIET, all of them champion producers. ALCIBIADES is by *RASHAD IBN NAZEER, who sired just 33 registered get but 11 of them are champions or champion producers. *RASHAD IBN NAZEER is the sire of SHIKO IBN SHEIKH, sire of 5 National winners including the National Champions in driving SHIKOS FIREKING++ and SHIKOS SHANAIRE as well as multi-Top Ten winner in dressage SHIKOS ALLADAR. SHIKO IBN SHEIKH is the grandsire of National Champions in working cow horse, western sidesaddle and park (including multi-National Champion Park AEQUUS+/) ALCIBIADES is out of *BINT MONIET EL NEFOUS, dam of 5 champions (the fifth is western pleasure champion SIR WHITE MOON). RG AL MONE’s dam RG ANEMONE also produced his full brother, Region 4 Reserve Champion Stallion AOTH, East Coast Top Five Stallion and country pleasure and native costume champion SUDANS DES MONE. 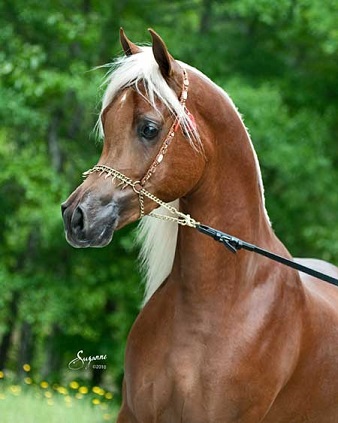 RAVENWOOD MONEE is out of SAUD EL MAAROUFA, a paternal sister to Egyptian Event Country Pleasure Champion SAUD EL WARSAW and Canadian Top Ten Country Pleasure SAUD EL MILANNE. SAUD EL MAAROUFA also traces to European Reserve Champion Stallion ANSATA ABBAS PASHA (a full brother to U.S. National Champion Stallion ANSATA IBN SUDAN), to *ADHEM (found close up in the pedigrees of U.S. Reserve National Champion Training Level Dressage ATR MM TALIFIRE, U.S. National Champion Half-Arabian Sport Horse Show Hack ATR and multi-National Champion dressage KHALENA ROYALE+/, and multi-U.S. National Champions in dressage KB OMEGA FAHIM+++//, KB JULL FAHIM+// and KHEHANAD ADHEM++/). In tail female RAVENWOOD MONEE traces to the very significant producer MAAROU, who is straight Babson. MAAROU is a dam and granddam of National winners. She is the dam of U.S. Reserve National Champion Novice Cutting and Top Ten Western Pleasure MAARDAN++. Two of her offspring produced National winners. Her son MAARDI is the sire of U.S. Top Ten Pleasure Driving MAARTHERA++. 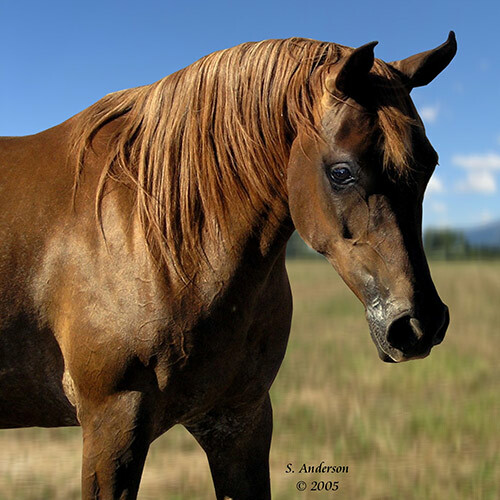 Her daughter MAAROUDANA is the dam of U.S. National Champion Stock Horse (now called reining) FADLOREN+, sire of U.S. National Champion Futurity Cutting and multi National Champion producer VALLEJO BUCKLE UP and of 17 time National winner BAR-FLY+/, a multi-National Champion in working cow horse and cutting. MAAROUDANA is the dam of 3 National winner producers. Her son BOMAARC sired U.S. and Canadian Top Ten Working Cow Horse AZTEC-PRINCE. MAAROUDANA’s daughter MAARLEE produced U.S Top Ten Futurity Filly OVERLOOK MAARLEE, dam of Canadian Top Ten Futurity Filly OVERLOOK MELISSA. MAARLEE’s son, National Champion sire JS PADRONOV is noted as a sport horse sire, with get including regional champion hunter and multi-regional champion dressage PHAETHON MR+/, regional champion sport horse stallion ZEUS MR, and AURORA MR++// (9 National titles in dressage including multi National Championships and regional championships in sport horse halter) and MAARLEE is also the dam of MARIA BLANCA, whose daughter PADRONS LOVE+/ is a multi-National Champion in western pleasure and a National winner producer. Thus RAVENWOOD MONEE comes from a very successful dam line. KYOBI RIHMA is out of ASASI MOONBEAM, whose daughter KYOBI QAHTAMA was exported to Saudi Arabia. Her sire RASMONIET RSI is a full brother to ALCIBIADES, sire of RG AL MONE. RASMONIET RSI sired National winners in Australia and regional winners in North America. 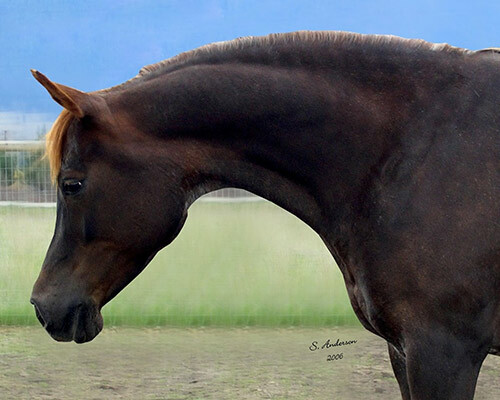 His daughter ENSHALLA JAISA is the maternal granddam of Canadian National Champion Stallion and U.S. Reserve National Champion Stallion and National winner sire *ENCHANTER MAGIC FHP. 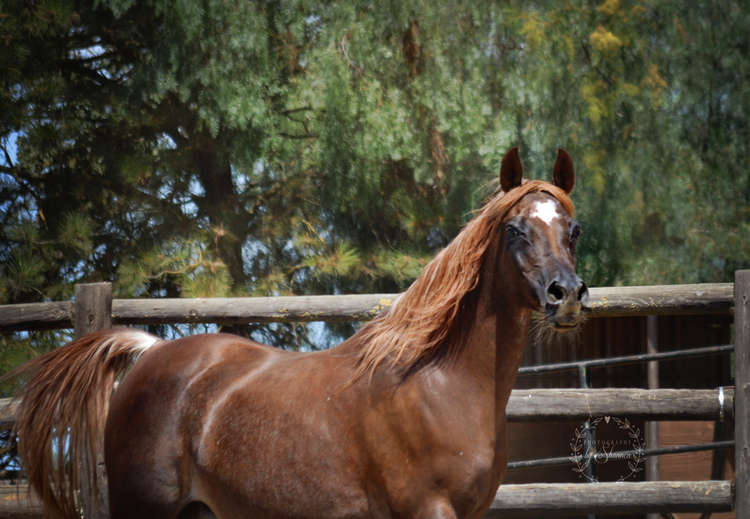 ASASI MOONBEAM is out of the Gleannloch bred QASTAL, also dam of multi-halter champion ASASI MAHSHALLAH, successful endurance horse ASASI KASBAH (760 ride miles in 18 rides with 16 completions), and to U.S. Reserve National Champion First and Second Level Dressage AOTR ASASI DIVA. Two of QASTAL’s daughters have been exported to Europe. QASTAL is by *SOUFIAN, sire of U.S. Top Ten Futurity Stallions EL SHALYAR and ROFANN (grandsire of multi-National Champion Hunter and Hunter Hack SMOOTH SAILING+//) and grandsire of Argentine Reserve National Champion Stallion and U.S. Top Ten Futurity Colt ABU KHAIL. 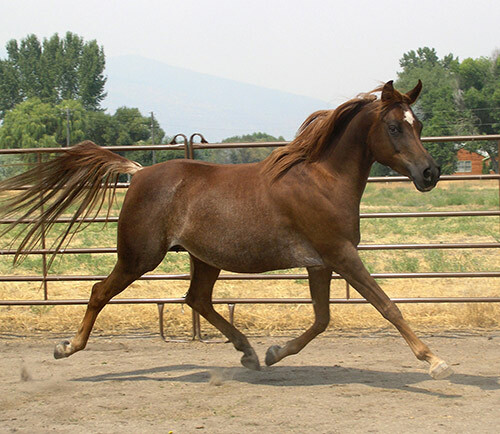 QASTAL’s dam NEAMA, a halter champion, is by multi-National Champion Park and Native Costume *SAKR+++, a sire of National Champions in halter and performance including multi-National Champion Native Costume SHAKR and U.S. National Champion Futurity Colt NABIEL+/, sire of National Champions in halter and dressage. NEAMA’s dam *NABILAHH produced 3 champions, 6 champion producers and 3 National winner producers including *KHOFO++, a multi-regional halter and performance winner and sire of National winners in halter and performance. *KHOFO++’s daughter BINT MAGIDAA is the dam of U.S. Reserve National Champion Stallion RUMINAJA ALI, sire of U.S. and Canadian National Champion Stallion ALI JAMAAL and grandsire of U.S. Reserve National Champion Stallion THEE DESPERADO (the leading living Egyptian sire of champions) and World Champion Stallion, U.S. Reserve National Champion Senior Stallion and World and National Champion sire *GAZAL AL SHAQAB. *NABILAHH is also the dam of BINT NABILAHH (dam of U.S. Top Ten Futurity Filly, Egyptian Event Supreme Champion Mare, Israeli National Champion Mare and Middle East Champion Mare and National Champion producer MAAR BILAHH) and of BEN MORAFIC, sire of 2 National winners in performance). *NABILAHH is a paternal sister to U.S. National Champion Western Pleasure and Top Ten English Pleasure *NIHAL++ and to the National Champion producers *DAWLAT and *KAHRAMANA. Thus, KYOBI RIHMA comes from two parents with exceptionally strong dam lines, thus contributing to her own success in producing high quality offspring.